After working for years on Final Cut Studio, I've always turned to Final Cut and Motion when I need to produce demo videos, using Snapz Pro X to capture the screen. I needed to do some Windows capturing this week, so those weren't an option. Instead Nick Napp recommended I check out Camtasia, and I've been very impressed. It's got extremely limited functionality and flexibility compared to a professional editing suite, but its laser-sharp focus on a single workflow makes it a dream to use if you're producing screen-casts. Here's how it works. That brings up the Camtasia Recorder program. After you select an area, you can start the capture process by clicking the Record button that appears at the bottom right. Even running through Parallels on my MacBook Pro, the capture process didn't noticeably affect application performance. Once you've run through the steps you want to demonstrate, press F10 to stop the recording. As soon as it's done, a preview of what you've just captured will play back. That's a great chance to do a sanity check on your material, to make sure you've captured the right area and everything seems roughly correct. If you're happy with what you've got, click on the Save button to store the video. 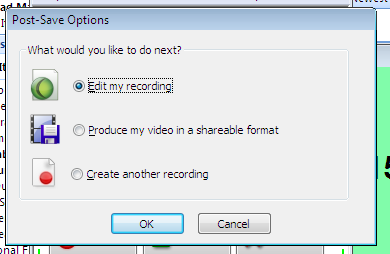 Choose Edit my recording from the options dialog, and click OK to begin a new project based around that movie. Leave the options at their defaults, except for SmartFocus, which I prefer to turn off and rescale, rather than having it automatically crop based on the area you're working with. 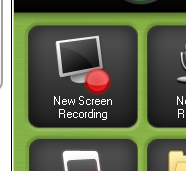 They've created custom UI for the dozen most common tasks you'd need to do when editing a screencast demo. Each of these is a modal interface that guides you through the process, offering a small set of targeted options specifically for the job at hand. 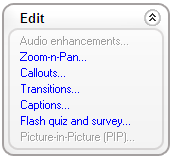 For example the Voice narration section will extend a hold frame of the current clip to match the length of your audio. Probably my single favorite feature is the Zoom-n-Pan control panel. It's surprisingly hard to handle scaling and cropping to a specific area of a video even with the slick UI of Motion, though using a camera with the new 3D helps. To move to a small area of the screen in Camtopia, all you need to do is select the region, choose how fast to move to it, and the program handles figuring out the animation needed to get that result. Once you're satisfied with the look of your piece, you can move on to producing the final output. I was again very impressed by the targeted options. Being able to render directly to a self-contained flash video for the web was a lot easier than my previous hand-tweaking of codecs in QuickTime Player. Even better, the options it used resulted in a file that only took up a few MB for a minute of video, with no noticeable artifacts. Overall, I really liked the thought that had obviously gone into designing Camtasia. It's no competition for a professional editor if you're producing a general feature, but it's perfect for the job it's designed for, producing screencast demos.